Subject: Cyrrus generated the user, technical and process requirements for new and legacy Communications, Navigation and Surveillance Systems Procurement for Birmingham Airport’s new Control Tower Building (CTB). Birmingham Airport Limited (BAL) required the procurement of new Communications, Navigation and Surveillance (CNS) Systems to operate their new CTB. While procuring a range a new equipment, BAL also required the integration of a number of legacy systems to the new infrastructure. Cyrrus Limited was engaged by BAL in January 2012, to provide independence in the definition and documentation of user, technical and process requirements for the procurement of the CNS. Having already worked with BAL in the procurement of their new primary surveillance radar, Cyrrus had first-hand familiarity and experience of the operation and equipment needs for the proposed new building. As a first step, user requirements for the new systems needed to be captured and Cyrrus used their tried and tested approach, building on best practice Systems Engineering process, to produce requirements documentation for the tender process. Working with airport staff, user requirements were defined, capturing the high-level requirements of both controlling and engineering staff due to operate in the new CTB. This included both operation and support of the equipment itself, as well as requirements for staff training. The next task was to examine and document the mandated regulatory requirements, confirming those applicable to the systems to be procured. The incumbent Air Navigation Service Provider at Birmingham Airport defined the safety requirements. Using these high-level documents, Cyrrus produced the Birmingham Airport System Requirements Specification which informed the formal technical requirements of all CNS systems to be procured and installed, also identifying the external interfaces and required data needs. Statements of Work were produced, describing the processes required of potential suppliers to ensure project delivery was conducted in a controlled, efficient and effective manner, including integration requirements of legacy systems. Cyrrus also assisted in the production of the tender pack, which included the Invitation to Tender instructions, Contract Statement of Work and applicable Model Form of Contract Schedule. Cyrrus conducted the technical evaluation of all supplier submissions using their tried and tested independent process. This examines the compliance of each supplier’s response to the technical requirements, their ability to conduct the project in accordance with the process requirements and the value for money of the solution proposed. This evaluation was based solely on the information provided in the submission, ensuring a level playing field for each supplier. Cyrrus produced a detailed report, individually scoring the supplier submissions and explaining the rationale behind the transparent process. The report included guidance and a number of recommendations to assist the Airport with contract negotiation. Birmingham Airport Limited awarded the contract for provision of CNS systems in June 2012 and the impressive new CTB is now fully operational housing cutting edge CNS equipment. This state-of-the-art, 7 storey and 34 metre high, £10 million CTB was crowned the West Midlands property project of the year and those involved have received a shower of praise for their participation in the project. 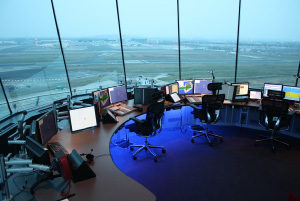 “Cyrrus were delighted to assist Birmingham Airport Limited achieve delivery of a high specification, iconic Control Tower Building facility that will support the Airport’s operation well into the future. Birmingham Airport Limited are a valued client who we hope to be able to help again in the future”.